Console application: exception is not handled. Application terminates with $0EEDFADE error code. It's usually used when you don't want to change existing visual experience at all, but want to add EurekaLog's capabilities to your application. If you set this dialog for your application then it will perform EurekaLog's tasks like saving bug report and/or sending report to developer and then invoke default error processing as if EurekaLog isn't here. Note: Unlike any other dialogs, this dialog invokes EurekaLog's tasks first and only then invokes standard error dialog - that's because standard error processing may include application's termination, so reverse order will not invoke EurekaLog at all. 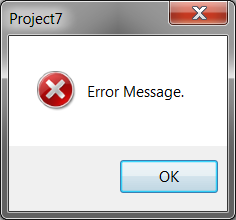 Take this into account if you want to show messages about send status - they will be showed before error message itself. This dialog will store an empty "steps to reproduce" text, uses default user e-mail and perform report sending (as if the user has clicked on "Send" button) and sends screenshot, if it was created (specified in send options). Default user information is extracted via GetUserEMail, GetUserFullName and GetUserName functions. You can set default user e-mail by calling SetUserEmail function. This dialog is not customizable. If you want a customized behaviour - you need to use one of EurekaLog's dialogs instead.